Free Patterns · hats · Misc. I did a guest blog yesterday. 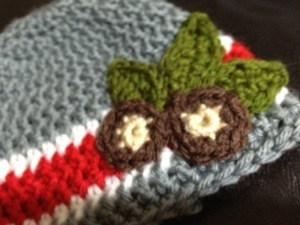 It’s the buckeye baby hat pattern. You can find it here. Here’s a picture of the completed item. Hi! I left a comment on your FB page, but wanted to let you know that the pattern for the hat disappeared off of the guest blog site! I don’t know what happened, but now I can’t find it to print it off and begin crocheting!! I appreciate your help!! Thanks! Weird. I’ll put it up on here in an hour or so. Got the link and it is awesome! Worked up very quickly during the Steelers/Bengals game!! Thanks so much!! As long as you weren’t rooting for the Steelers ;).